Things are going well with the Five Coat! So now that I am at last on a roll, its time to tackle the inside pockets. Doing welts in a heavy woven material such as wool, or even better the Malabar or Alcantara my Tennant Coats were made from, has been quite easy for me as they are quite sturdy and self-supporting. As a result I had the chance to perfect my technique over the numerous coats I had made (see right). However, I find that lining material is much harder to work with. Its weave allows the fabric to skew out of shape at the slightest touch and when you least expect it. You could be cutting it, and not realise it is already skewed, making your cut piece the wrong shape; or it may skew or slip as you are sewing, causing seams not to meet up as planned, so I was dreading doing something as delicate and technically demanding as a welt into lining. But today was one of those eureka moments - when I found something that had been puzzling me for a long time, turns out to be much more simple than I had ever hoped. I was looking at what to do for the inside pockets for the Five Coat and was agonizing about making welted pockets in the lining fabric. The usual approach when handling thin material is to iron some interfacing onto the back surrounding the area to work on.This can easily become very obvious when done in lining fabric, so I was keen to find a way of doing it where this did not show. I recently bought a cheap jacket from a charity shop (see left) with the intention of dissecting it to get a better pattern for the fronts of the Five Coat. 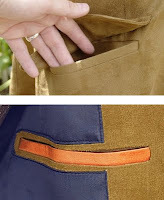 This jacket also had just the right type of inside pockets I wanted to replicate, so I took a closer look (see above). To my amazement I discovered the upper and lower welts were made from a single piece of lining fabric, backed up with a non-fusible interface. Looking closer at the ends of the welts, I could see it zig-zagged back on itself creating the welts and somehow went around the pocket opening (see below). But how had it been done? To work out its secret, I needed to take the pocket back to the point when the pocket opening had been slit and the welts turned. I removed the pocket bag, and unpicked the stitching at the sides. I was then free to turn the welts back to the position they had been stitched in - and it was all clear and so simple. Basically, a single piece of fabric is pressed with two parallel creases and this is sewn face-to-face with the lining. Then, when the pocket opening is slit, it is cut through the conjoining fabric of the welts as well as the body of the lining. The welts are turned as usual and I discovered the triangles at the sides of the welts also get neatly caught up in the turn, making them more secure than a conventional two-part welt like I have performed before. Another advantage is that because both welts are on the same fabric they can be made perfectly parallel, rather than one or other slipping during sewing, making for an uneven or wonky pocket opening. I then did my first test, which I did into calico, as I was more interested in the mechanics at this stage and did not want the lining material sliding around on me. I did not have any non-fusible interface, so I used another piece of calico as a substitute. The welts themselves I did wrap in lining though (see right). I was pretty happy with the result, given it was a first test (see left). I found it was a lot easier to replicate the construction than I thought, and when the welts were turned they were very rigid, even though they did not have and fusible backing to them. I then did a couple of tests in full lining quality material. As it happens I have a commission for a random jacket, based on the same pattern as the Five Coat, but it will be in a totally different colour and finish. This has given me the opportunity to be a little more creative as we are looking for something we like, rather then aiming for a perfect match to screen-used garment. 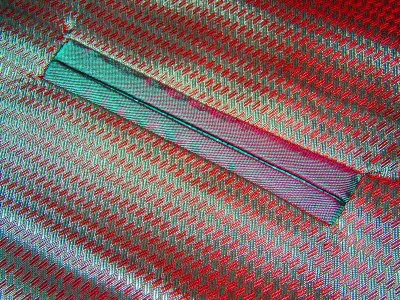 For the lining I have discovered an eye-catching iridescent red/green satin fabric. I found two versions: one a plain; the other with a woven pattern. I have suggested using one as the body of the lining and the other to accent the pocket welts and sleeve linings - but we can’t decide which way around! So to practice making this new design of welt, I have made samplers of each combination to send to my client so he can choose. These photos show the progression of the welt. First the double-folded welts are sewn onto the face of the fabric (see below far left); on the reverse I have put a patch of calico for surrounding support, and this is sewn through as well (see below centre left); I then slit through the supporting calico, the lining fabric and the conjoining part of the welts below, finishing in a Y shape at each end, cutting as close to the ends of the stitch line as possible (see below centre right); I then turn the welts through to the back and carefully tug everything straight (see below far right). I can then press the pocket to make it nice and sharp and clean (see below). Personally I prefer the version shown above, with the patterned body and plain welts. I hope he likes the finished result. Your Fifth Doctor coat is amazing. I would be very interested in a Season 19 one.